Workshops are a fun way of learning a new skill in a friendly and encouraging environment, meeting new people and having something you have made to take home with you. 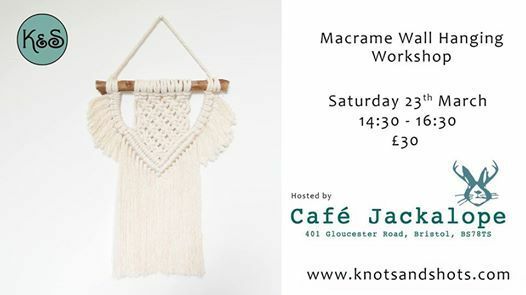 In this class you will learn the basics of macrame including suitable materials to use, knotting techniques and how to build patterns with those knotting techniques. You will make your own wall hanging from start to finish and leave with knowledge of how to design and make your own unique wall tapestries. Cafe Jackalope is a beautiful cafe serving delicious edibles and beverages, the space is bright and calm with stunning decor and plants everywhere. 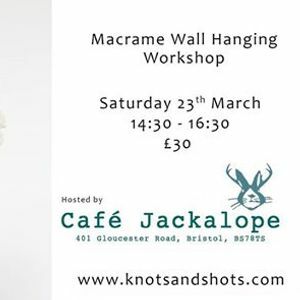 It is an ideal place to host a workshop and I can't wait for you to join me there! All materials provided and small class sizes ensure focused tuition. You must book in, this is not a drop in class. Payment upfront will be required to confirm your place, this payment is non refundable but you may transfer to a later date if you cannot make the original booking.